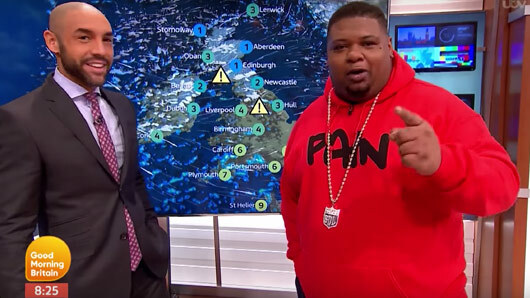 Weather presenter Alex Beresford should probably fear for his job after Big Narstie stole the show today on Good Morning Britain. With the studio in fits of laughter, he continued: “Edinburgh – peak times. The musician ended his segment with some words of wisdom for all UK inhabitants: “Please dress appropriately for the weather, and ladies and kids dress warm.